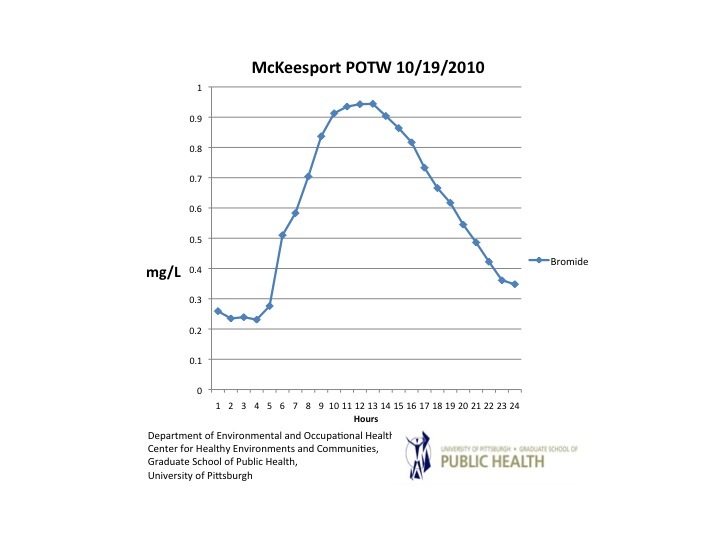 In yesterday’s FracTracker post, CHEC’s data manager Matt Kelso told the tale of two stories regarding radionuclides in Marcellus Shale flowback water and in river water as sampled by the PA DEP. As he said “the devil is in the details” and here are the “devil’s details” that put both stories into their proper public health context. Elevated concentrations of naturally occurring radioactive materials(NORM), including 238U, 232Th and their progeny, are found inunderground geologic deposits and are often encountered during drillingfor oil and gas deposits (Rajaretnam G, and Spitz HB., 2000). Drill cuttingsfrom the Marcellus may be enriched in radium radionuclides and off-gas the radioelement radon. Also, the activity levels and/or availability ofnaturally occurring radionuclides can be significantly altered by processesin the oil, gas and mineral mining industries (B. Heaton and J. Lambley,2000). Scales in drilling and process equipment may become enrichedin radionuclides producing technologically enhanced naturally occurringradioactive materials (TENORM). Exposure to TENORM in drillingequipment may exceed OSHA and other regulatory authority standardsfor the protection of both human and ecological health. The occurrenceof TENORM concentrated through anthropogenic processes in soils atoil and gas wells and facilities represents one of the most challengingissues facing the Canadian and US oil and gas industry today (Saint-Fortet al., 2007). The risk of contamination of surface water and ground waterby TENORM accompanies the risk of soil contamination, as TENORMgenerated may runoff of drilling equipment during rain events or if onthe soil surface into surface water sources and/or enter groundwater bytransport through the unsaturated zone. New York’s Department of Environmental Conservation (NYDEC) reportedthat thirteen samples of wastewater from Marcellus Shale gas extractioncontained levels of radium-226 (226Ra) as high as 267 times the safedisposal limit and thousands of times the limit safe for people to drink.The New York Department of Health (NYDOH) analyzed three MarcellusShale production brine samples and found elevated gross alpha, grossbeta, and 226Ra in the production brine. Devonian-age shales containnaturally occurring radioactive material (NORM), such as uranium (U)and thorium (Th) and their daughter products, 226Ra and 228Ra. TheMarcellus Shale is considered to have elevated levels of NORMs. NORMsthat have been concentrated or exposed to the accessible environmentas a result of human activities, such as mineral extraction, are defined bythe EPA as technologically enhanced NORM (TENORM). TENORM maybe concentrated because of (1) temperature and pressure changes duringoil and gas production, (2) 226Ra and 228Ra in produced waters reactingwith barium sulfate (BaSO4) to form a scale in well tubulars and surfaceequipment, (3) 226Ra and 228Ra occurring in sludge that accumulates inpits and tanks, and (4) NORM occurring as radon (Rn) gas in the naturalgas stream. If this flowback-produced water with elevated TENORM is disposed ofin sewage treatment facilities or other ineffective wastewater disposalprocesses – then the TENORM level in surface water (the receiving streamor river) will be largely determined by dilution offered by fluid flows withinthe waste plant and dilution offered by the water flows themselves in theriver or stream. So, it is entirely possible that Marcellus Shale flowback and produced fluids(yes I hesitate to call it water because it is contaminated fluid – with manyidentified toxic contaminants; if this were coming from other industries itwould be a hazardous liquid waste) will have elevated levels of TENORM and many other contaminants (see explanation in Appendix 1 below) butlevels of TENORM in the surface water it is going into will not exceedbackground levels, seen in the stream or river system, once it is completelymixed in the stream or river. But here is the devil in the details as Matt said in his article.Recreationalists fish and boat around these outfalls (this is documentedby CHEC in the Allegheny River Stewardship Project and the PittsburghFish Consumption Project), and we have no idea of the levels of TENORM(or other contaminants) in receiving water near the outfalls before fullriver mixing occurs. 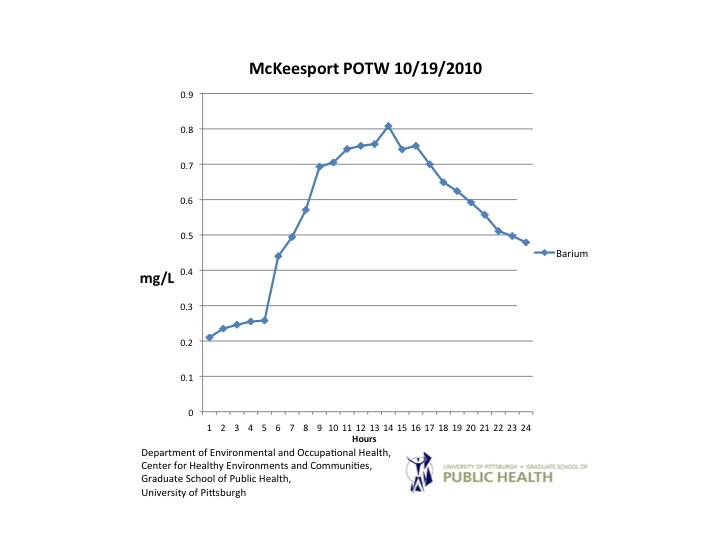 Additionally we have no idea of the level of long term bioaccumulation of TENORM (and other contaminants) in fish and otheraquatic resources that may frequent or live in areas where this material isdisposed of in. Concentrations of TENORM and the many other contaminants in the effluent from treatment of oil and gas flowback fluids will vary in receivingstreams and rivers according to the flow of water in the receiving streamor river and their concentrations in the flowback fluids. Therefore, levels ofTENORM in receiving streams and rivers will reach a peak (everything elsebeing equal) during times of low flow – such as a drought or long periodswithout rain or snowmelt – and peak levels will be higher in the surface waternear the outfall then downstream in the river after it is mixed completelywith water flow from the stream or river. The PA DEP river water samplesfor radium were not taken during periods of low flow but during the fallseason when rain was more plentiful. Furthermore, they were not taken near outfallsof plants accepting oil and gas waste fluids for treatment, before completemixing occurs—therefore, peak levels in these areas were not captured bytheir sampling plan. 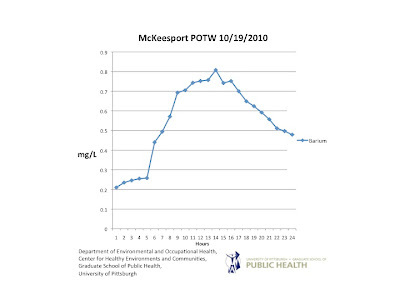 Additionally, levels of TENORM (and other contaminants) from sewagetreatment plants and inefficient brine treatment plants will be higher inlow volume streams (such as 10 Mile Creek in Greene and WashingtonCounties and Blacklick Creek in Indiana County) than in large volume riversystems like the Monongahela River. We simply don’t know what levels ofTENORM are like at peak levels in low volume streams during periods oflow flow or in areas just downstream of effluent outfalls before completemixing takes place. 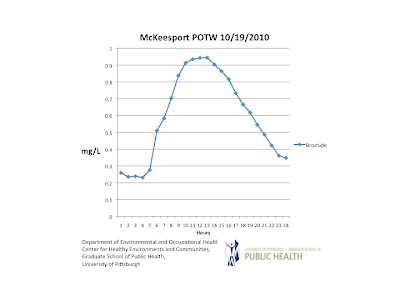 CHEC has data showing that levels of bromides, barium and strontiumexiting the McKeesport POTW (a sewage treatment plant) vary over a day’s sampling; they aredependent on when the slug of produced-flowback brine is introduced intothe system and the slug’s rate of entry into the treatment system. 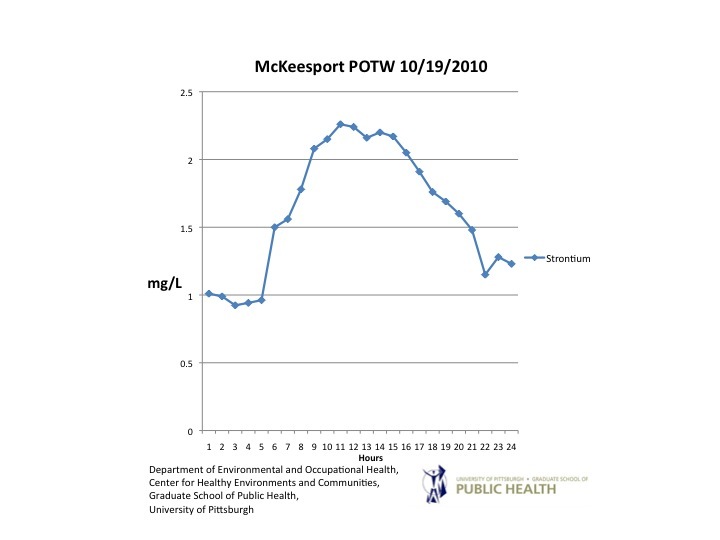 At theMcKeesport POTW, it is customary that the slug of oil and gas waste fluidis introduced into the treatment system at 7pm. One sees that the levels ofthese contaminants in outfall effluent raises sharply over a short period oftime and then falls back to baseline (See CHEC figures 1, 2 and 3), whenthe slug is through the system. Any TENORM, in the oil and gas waste fluidbeing treated, not taken out by the treatment system will reasonably followthe same pattern. 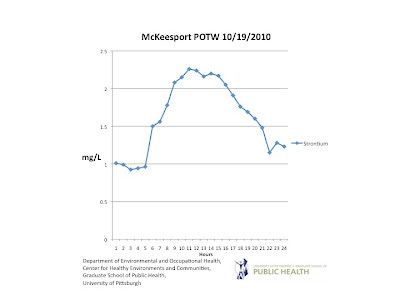 That is it will come and go quickly and we have no ideaof peak levels of TENORM or any other contaminants in the stream or rivernear the treatment plant outfall. What is the solution to all this? Are we to sample continuously – at alltreatment plant outfalls, in river and stream segments between treatmentplant outfalls and water intakes, at all water intakes and in all finisheddrinking water (and I might add in private well water systems that may pullin contaminants from nearby streams and rivers) across the entire areaMarcellus Shale waste fluids are being disposed of? (This would includePennsylvania, New York, Ohio, and West Virginia). This is exactly whatis necessary to be done to assure protection of drinking water supplies,recreationalists, and the health of aquatic resources if we continue to allowoil and gas flowback water to be disposed of in sewage treatment andinefficient brine treatment plants. NO – this would be cost prohibitive and impractical to do on the scale thatis necessary to protect public health and aquatic resources. We must usethe precautionary principal here and insist that sewage treatment plants notaccept oil and gas wastewater, period. Batches of oil and gas wastewaterneed to be tested continuously for levels of TENORM and all other possiblecontaminants so that a determination can be made of where the fluids canbe adequately and safely disposed of. Fluids that are determined to behazardous and/or toxic should be transported only by certified haulers andloads need to be properly manifested so there is an accurate accounting ofthe volumes of waste and where it is being sent for ultimate treatment. Thetechnical capabilities and acceptance of brine fluids, of and by, oil and gaswaste fluid treatment facilities must be matched exactly to the realities oflevels of contaminants in the brine fluids. The intent of the Resource Conservation and Recovery Act (RCRA) wasto ensure that there is a “cradle to grave” system to document, handleand dispose of all hazardous and toxic waste from all industries and evenmunicipal authorities in a safe and effective manner. RCRA is basically anextension of the environmental public health precautionary principal – andif implemented and enforced thoughtfully and comprehensively preventsthe formation of new Superfund sites and will assure that the publicand environmental receptors are protected from contaminants in oil andgas waste fluids- be they called flowback or produced water, or brine oranything else. Hydraulic fracturing (HF) of shale gas deposits uses considerable masses of chemicals, for a variety of purposes to open and keep open pathways through which natural gas, oil and other production gases and liquids can flow to the well head. HF, also known as slick-water fracturing, introduces large volumes of amended water at high pressure into the gas bearing shale where it is in close contact with formation materials that are enriched in organic compounds, heavy metals and other elements, salts and radionuclides. Typically, about 1 million gallons and from 3-5 million gallons of amended water are needed to fracture a vertical well and horizontal well, respectively (Hayes, T; 2009, Vidic, R.; 2011). Fluids recovered from these wells can represent from 25% to 100% of the injected amended water solution (Vidic R., 2011) and are called “flowback” or “produced” water depending on the time period of their return. While there is at present considerable scientific inquiry and even controversy regarding the potential of vertical or horizontal fracturing of shale gas reservoirs to contaminate shallow or confined groundwater aquifers (thus exposing municipal or private well water users to chemicals used in the hydrofracturing process and/or toxic elements, organic compounds, and radionuclides that exist in the formation materials); disposal of oil and gas wastewater/ Marcellus shale brine water in sewage treatment plants or inefficient brine wastewater treatment facilities is a direct exposure threat to public health through ingestion, inhalation and dermal absorption exposure pathways. >I was wondering about the issue of radioactive water and how it can be treated by municipal water treatment plants. It looks like it can't be. Radiation in; radiation out. Therefore, the waste water needs to be monitored for radioactivity and when ionized water is found, it needs to be managed as a nuclear waste product. Thanks for the writeup on this issue. And timely – and sorely needed. I hope you & Sam come east again soon.